Ketchup is often one of the last foods to make the transition to a REAL FOOD diet but is so simple to make at home. How can we recreate the flavors that pair so well with our favorite foods and reminds us of childhood? 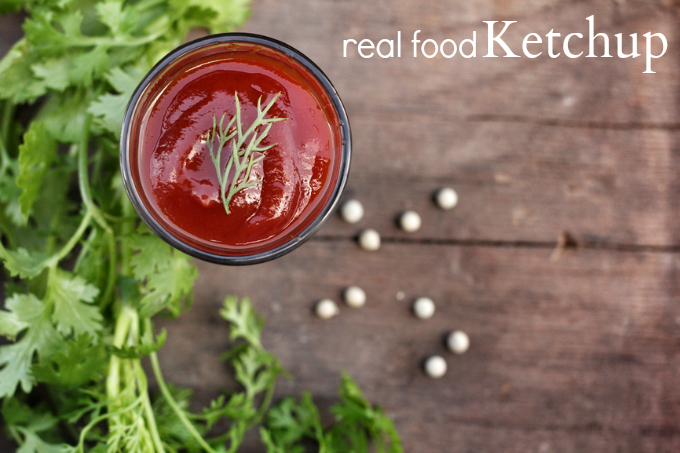 This simple real food ketchup recipe does just that but adds a richness that only comes with fresh ingredients. We used readily available foods, made sure it created almost no mess, and created an option that was easy to whip up when you needed a new batch. The beauty of making your own is that many of the ingredients can be changed up to fit to your tastes. This recipe is so simple that you can use it to create your perfect ketchup. By replacing the garlic with shallots or switching out vinegar flavors, the recipe can have a whole new flavor profile. It also allows for substitutions when food allergies are an issue. The lacto-fermented option* is for those looking to include more fermented foods and probiotics into their diet. This one is our perfect ketchup. The sauerkraut juice is tangy but subtle and oh so delicious. Throughout history, condiments were traditionally fermented and impart wonderful flavor and health benefits. These nutrient-rich foods aid in digestion by increasing enzyme activity and boosting the friendly bacteria in our digestive tracts, both of which help break down food and make nutrients more accessible. *This is a reflection of Nourished Kitchen’s fermentation method for homemade ketchup. This ketchup is the result of trying countless real food recipes that fell short of our expectations. I combined the classic flavors of store-bought ketchup with the deep, rich flavors of fresh ingredients. The extra step of fermentation deepens the flavor complexity and adds the gut healing properties of probiotics. Add all ingredients to a small saucepan and stir thoroughly to combine. Note: If making lacto-fermented version, reserve 3 Tablespoons of brine to add during last step. This version cannot be made without some type of fermenting culture, so a recipe consisting only of vinegar will not ferment properly. Simmer on medium low for 20 minutes, stirring occasionally. Note: I prefer to leave a lid partially covering the ketchup to keep splatters contained. Allow to cool completely. Blend ingredients in food processor if a smoother texture is desired. Place in desired glass storage container and refrigerate. Note: For lacto-fermented ketchup, use a mason jar (or similar container) and stir in 1 Tablespoon sauerkraut or vegetable brine. Spoon remaining 2 tablespoons over top of the ketchup to cover it with a thin layer of brine that will assist in fermentation. Cover and leave in a warm place for 3-5 days. The bubbles that result are a sign that fermentation is taking place. If it smells or tastes bad or begins to grow any yeast or mold, throw it out and start over. When the ketchup has finished fermenting, stir thoroughly and refrigerate. Non-fermented version will last at least a week in the fridge and fermented should last at least 1-3 months in the refrigerator. This will vary depending on many conditions like all perishable foods, so inhale it like we do or keep an eye on it. wow! it sounds so easy to make!!! It really is! Making things from scratch always sounds so labor intensive, but this one is definitely not. You can also make it in large batches and freeze some when you are happy with the flavor to save even more time. We have just discovered that we do the same now. 😀 I am going to start quadrupling my batch to hopefully last us a month. I love when my family is enthusiastic about the foods I make. I have a ketchup recipe I usually use that I really like (http://www.thecheerfulagrarian.blogspot.com/2011/05/homemade-ketchup.html) but I don’t have to cook it – I’m curious, why do you cook yours? Does it change the flavor? Ruth, Thanks for sharing your recipe. 🙂 I found cooking to be key in making it taste more like store-bought. Since I use raw garlic and onion, cooking also allow the flavors to meld better and mellow. It ultimately creates a richer flavor than the uncooked ones I have tried. I love to mix it with kombucha mustard (recipe to come) for the perfect condiment combo. If you try it, compare the two and let me know what you think! This sound really good! I love making my own products whenever I can. Thanks for the recipe. Making things from scratch is so much more fulfilling than I would have ever thought. It’s so great to have a community where we can all share and grow together. I would be happy to share my recipe at the Smart Solutions linky party. New blog hops are always fun! you mentioned freezing this in batches. Could this also be canned? I do a lot of canning–and making my own ketchup is something on my list for this summer! Absolutely! The lacto-fermented version will no longer be viable if canned, because the high temps will kill the probiotics. That’s my favorite version flavor-wise, so you can try making a thicker version without the sauerkraut juice and add it in & follow the fermented instructions after you open a batch. This is a new one for me… where do I get raw, fermented sauerkraut brine?? Is this something I can actually find in the health food section of my grocery store? My boys (five years old and 42 years old!) love ketchup and we are growing heirloom tomatoes this season so I am very excited to try this recipe! You can either buy it or make sauerkraut and use the brine from that. Bubbie’s is a common brand that is available at most health food stores. You can also find homemade sauerkraut at some farmers’ markets. This is all new to me and some of it sounds like a laungage I don’t understand. I am going to try the baby steps and hopefull some day I will get it all and be happier and healthier. It is all quite overwhelming when you first step into the ‘natural’ world. Definitely take it in baby steps and go as slowly as you need to. Every step you take will add to your health. I really want to make this! I have two questions: do you buy or make your own tomato paste and can I use pickle juice instead of sauerkraut juice? I would love to make my own tomato paste, but I’m still buying it right now. I think pickle juice would be a fun twist on the flavor. I would experiment and see if you like it. You can use anything as long as it tastes good to you! When not adding the fermented part and just using vinegar is there a specific kind of vinegar? Spot on! My hubby is a ketchup connoisseur, and he loves this! When you say “or use equal amounts vinegar”, that’s increasing ACV or the addition of white? Increasing the amount of ACV to replace the sauerkraut juice. Could I use whey in place of the sauerkraut juice? Thanks! Yep! It will change the taste slightly, but you can definitely experiment with other fermented juices. I was under the impression that food will not ferment if you use vinegar. I looking forward to trying the recipe. I would love to make this but I don’t know what or where to get the raw sauerkraut juice. If you can let me know I would really appreciate it! Sure Mandi, you can either find a recipe online and make your own sauerkraut or contact your local health food stores to see which ones carry it. Pingback: Luau Beans- Baked Beans with Pineapple - Yum! Would both freeze well? Or would the freezing defeat the fermentation? I’m going to attempt the unfermented kind first (as that’s what I have the ingredients for currently), but I will venture into the fermented sooner or later. Any tips would be great, thanks! And thank you for sharing! Hi. I’m currently trying this recipe, but I’m concerned it’s not fermenting properly. I used slightly less brine than you call for (it’s all I had), and put the ketchup in a mason jar. I see tiny bubbles all over after a day, but there is no buildup of pressure. I made my first batch of sauerkraut a few weeks ago, and I had to burp it every day! This is nothing like that, how do I know it’s fermenting properly, or at all? Tiny bubbles are a good indication of fermentation. I don’t find that there is strong fermentation action in fermenting condiments, so I’ve never had to burp mine (though I do it anyway just in case). Does this cause botulism. i just shared your recipe ( your link) on a Facebook page and I have been bombarded that fermentation with cooked veggies can cause botulism. I have been using this recipe for a while without any issues. Can i use water kefir in it? You can certainly try it. You’ll get a sweeter taste, so you may want to adjust the sweetener. Wondering about using water kefir as well for the brine. Finally made this last night and use a bit on a meatloaf I made for my teen. He ate three helpings! We have been ketchup free for a while since we cannot have sugar and we have hated most ketchup recipes I have tried. This is a winner!!! Thank you!!! Hello, quick question, is the 1/4 cup brine added while making and then the additional 3 tablespoons used for fermenting or do I not add any brine while making? Thanks! Add the 1/4 cup to the cooking mixture and then use the 3 tablespoons to ferment the entire mixture once cooked and cooled. Pingback: 20 something allergies and counting…down – My Favorite Book Just Got Better! Thank you so much for sharing this! 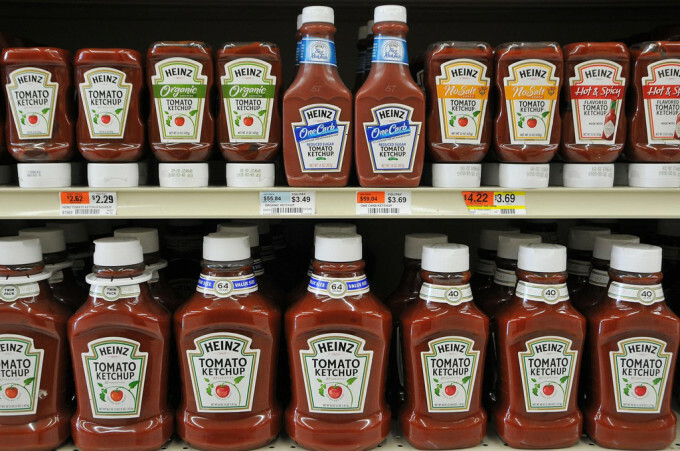 I would love to have ketchup that instead of being filled with corn syrup is filled with probiotics! So much better for the family. Cannot wait to try making this at home!